For sometime now, the idea of venturing into to another planet has been the stuff of science fiction. The various and famous missions to the Moon were the first step towards reaching the lofty dream goal, eventually turning a gaze towards our planetary neighbor Mars to journey to. While no human has sent foot on the red planet (so far), NASA has been keenly studying Mars over the years, send off a rover to survey it (back in 1996) and the recently discovered news that rivers currently flow underneath its surface; a sign of another step closer towards one day colonzing the planet for mankind to live on. While that notion might many years away, many of the media outlets (books, TV, and film) have already dreamed up the possiblites of such outer space ventures. One such story has got the eye of 20th Century Fox and film director Ridley Scott, adapting the written science fiction work of author Andy Weir with the movie The Martian. Does this big screen adaption reach outer space excellence or is it a failed cinematic mission to Mars? 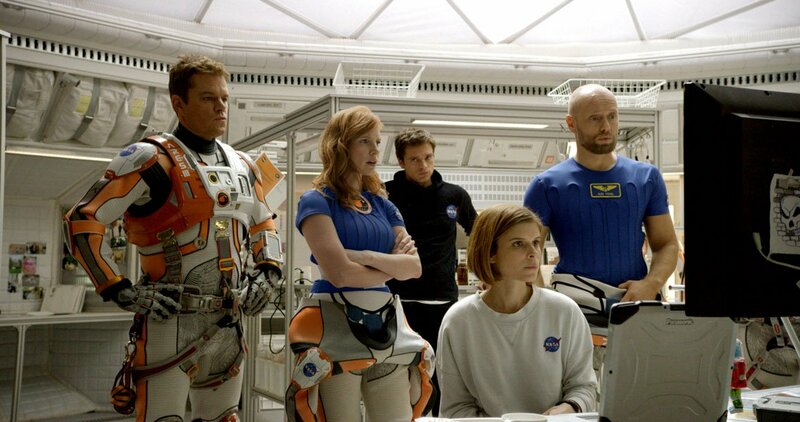 On an exploration mission to Mars, botanist Mark Watney (Matt Damon) has a jovial camaraderie with his Ares 3 crew members Alex Vogel (Aksel Hennie), Beth Johanssen (Kate Mara), Chris Beck (Sebastian Stan), Rick Martinez (Michael Pena), and Commander Melissa Lewis (Jessica Chastain) During a fierce storm, Mark is hit by flying debris and is presumed dead by his crew members as they hastily leave Mars and begin their return trip to Earth. Unbeknownst to them, Mark is wounded, but alive and quickly comes to the realization that he has been left behind, requiring his quick scientific thinking and survival instincts to survive his prolonged stay on Mars before a rescue team could be assembled. Back on Earth, NASA chief Teddy Sanders (Jeff Daniels) is baffled to hear that Mark is still alive, tasking intellect minds such as Vincent Kapoor (Chiwetel Ejiofor) and Mitch Henderson (Sean Bean) to come up with a plan to bring the lonely astronaut home. With limited time to exact a precise plan, NASA sets out to achieve impossible, while Mark continues to make Mars his new home, sharing his day to day trials and tribulations with a camera to document in his life on the barren red planet. I remember seeing the trailer for this movie and was completely awed by it. From just what I saw, I knew it was going to be a survival story in space (vaguely similar last year’s Gravity). I decided to pick up a copy Andy Weir’s novel The Martian and read the book in about a week. To me, I found the book to be very interesting and an average reading level for casual readers to read. So I walked into movie with the premise of the story already set in my mind. When the movie was finished, I felt exhilarated and excited, feeling that The Martian was a gripping and well-executed feature that’s a marvel to behold and an emotional surivival story at its core. The Martian is directed by filmmaker Ridley Scott. Scott, known for such films like Alien, Blade Runner, and Gladiator, takes Weir’s novel in his owns hands in paint a cinematic feature, but keeps a lot of the core nuances from book. An example of this is the film’s opening. Rather than presenting a very elongated movie prologue for viewers, Scott hits the ground running, opening the film up right before the impending Mars’s storm that seperates Watney from the rest of his crew members. Within five or so minutes of the movie, the plot is setting into motion and does away with laborious tasks of explanation and history (similar to how Weir’s novel was setup). And like the novel, the movie is about a stranded man on Mars as Scott (along with screenplay writer Drew Goddard) respects the Weir’s story with plenty of time to explore the trial and errors of Watney’s lonliness and surivial as well as NASA’s various attempts to mount a rescue mission. There are some changes here and there made (including omitting a large scene towards the story’s end), but I personally think that these changes don’t really hinder the movie from being highly enjoyable. Taking cues from other similar movies of a stranded hero that’s far from home, Scott gives The Martian a smart sense of humor to order to counterbalance out the tumultuous ordeal’s that Watney faces. Like the films Life of Pi and Castaway, Watney’s day-to-day life on Mars is a mixture of highs and lows in moments of joy, problem solving, and life-threating terrors. Most thanks goes to Weir for creating those mixture moments of humorous levity and science logistics in the narration in the novel, allowing Scott to builds upon that idea in order to create a very engaging film that captures the sense of survival isolation beautifully. Moviegoers and science buffs will find that The Martian does have some pockets of suspending disbelief with a few scenarios that faced Watney’s journey. And yet, while both Scott (and also Weir) takes science liberties in the narrative undertaking, The Martian is still effective and exciting to watch with emotional human drama at the film’s core and is easy to overlook some people’s minor rebuttals. In addition, those fearing of getting lost in all the scientific techno-babble like in last year’s sci-fi-film Interstellar, the terminologies used in The Martian are easy to follow (for the most part). At least, you won’t be scratching your head over certain things. 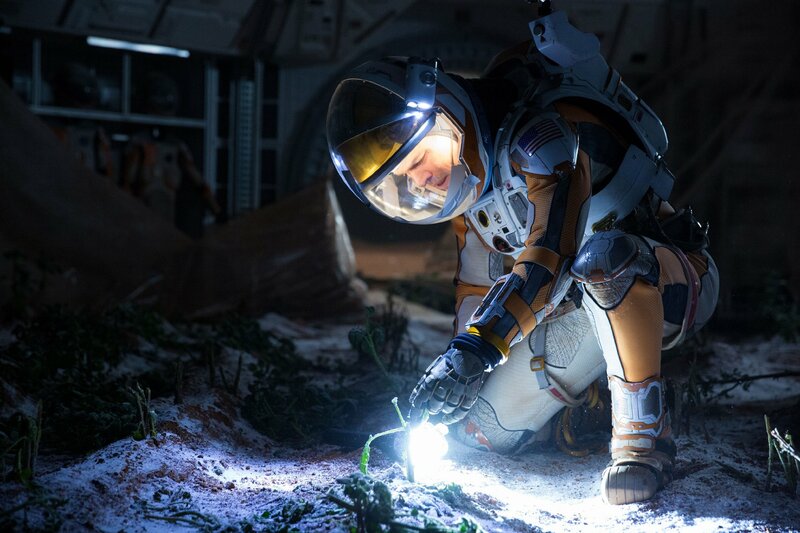 As one would imagine, The Martian’s production cost is hefty one and budgeted for $108 million. That is understandable; giving the fact that movie enlists some big name actors for its characters as well as making the movie look and feel like a summer blockbuster. Addtionally, the movie looks gorgeous. The landscape of the surface of Mars is hauntingly beautiful and does give off an otherworldy sense. The set designs of all the various NASA constructions (habs, vehicles, ships) are practically looking as well having a very distinct and sleek appeal to them. Even the music, composed by Harry Gregson Williams, delivers some great musical tones that change from slow subtle to big impactful meaning. There are even a couple of 70’s disco hits that appear in the movie that are little bit refreshing to hear in this sci-fi movie. At its heart, The Martian is a character drama that’s wrapped up in a sci-fi premise and (as I said before) the movie enlists of a group of talented actors to play the Weir’s characters on the big screen. At the film’s center is character of Mark Watney, played by actor Matt Damon. In the novel, Weir portrays Watney as a likeable protaginst that’s both inventive and humorous. Damon, an “A-list” celebrity in the current Hollywood echelon, does a terrific job as Watney, channeling the same charismatic charm and likeability that Weir created on pen. Aligning with that notion, Damon’s Watney gives off that “everyman” appeal, layering the character with inspring intellect and emotional human fragliness, one you just simply root for throughout the entire film. It’s a very intimate performance, a testament to Damon (both himself as a actor and to his character) as viewers can easily connect to his successes and failures. In short, the forty five year old actor is a great and smart fit for the film’s main character. With Damon acting as the central lead in The Martian, Scott enlists an all-star cast in the film’s supporting cast. Actors Chietewel Ejiofor and Jeff Daniels lend their weight and act as the focal point on Earth with their characters Vincent Kapoor, the head of Ares 3 Mission Program, and Teddy Sanders, administrator head of NASA contanstly debating the titular issues of trying to bring the stranded Mark Watney back home. Likewise, the Ares 3 crew members, consisting of Jessica Chastain, Sebastian Stan, Michael Pena, Kate Mara, and Askel Hennie, are equally affected in expressing their opinions of leaving their fellow astronaunt behind. Even smaller supporting roles by several actors, including Benedict Wong, Kristen Wig, Sean Bean, and Donald Glover are well done. Regardless of their limited screen time, Scott and Goddard (and even its original source material from Weir’s novel) masterfully uses their abilty to ultizes these characters to strengthen the movie rather than hindering it with muiltple stock and filler characters. Similar to last year’s Gravity, The Martian delivers at being a fantastic feature that wrapped up in sci-fi nuances, but is a very emotional piece of suriviving and determination out in the wildrness of space. Director Ridley Scott, despite some naysayers about some of his recent films, has proven to produce a stellar movie that captures blockbuster pomp and powerful human drama from an all-star cast and from Weir’s written source material. To me, it was awesome movie experience. There are few things to nitpick at about the movie, but it was great rescue-scifi thriller that was beautifully crafted and probably the best film (so far) of the 2015 Fall season. Mars might be 148 million miles away from Earth, but Scott’s The Martian allows viewers to travel to the Red Planet, showcasing its beauty, its danger, and the fictional tale of humanity and triumph. Hab breach . . . Implode? No, you would explode. They did a lot of research for this movie. Do not understand this error. Implosion requires exterior pressure. did you see the movie red planet ! because I viewed the martian and there are big similarities between them when they leave mars . the martian have plenty scientific stuff to understand ! red planet is easier to understand and is about 1H30 .the martian 2h45 where it could have been much shorter in time !! in the movie red planet they took also a previous mini rover to communicate with nasa . my only question about the martian is this the remake of red planet with new stuff just to get interesting ??? in my opinion they didn’t search very long for the scenario (it was copied from the red planet movie : just to think about it makes me want to yell to the author ridley scott are you a douchebag to produce a crap like that because matt damon take is own to grow some potatoes with ketchup in the movie ; ) so what is the difference between the two movies red planet I will gladly watch it again the martian not in my resting life !! !